An informant had the two singhs surrounded by the Indian security forces. After a 12 hour fierce encounter both singhs attained shaheedi. Bhai Surjit Singh was born in the year of 1969 in the month of Bhadron in the house of Sardar Harbhajan Singh and from the womb of Mata Mahinder Kaur in the village of Farandipur, near Bhikhiwind, Sursingh in the district Amritsar. As Sardar Harbhajan Singh was a farmer, Bhai Sahib also took interest in farming. There was no shortage of love and luxuries in Bhai Sahib’s household. Bhai Sahib studied at school in his childhood and after started working on the family farms with his father. The attack on Sri Akaal Takht Sahib in June 1984 and the fake encounters of innocent Sikhs changed Bhai Sahib, to revenge this injustice Bhai Sahib made links with Jhujaru Singhs. From his childhood, Bhai Sahib was very polite and showed respect to everyone as well as that he was a great admirer of Gurbani. 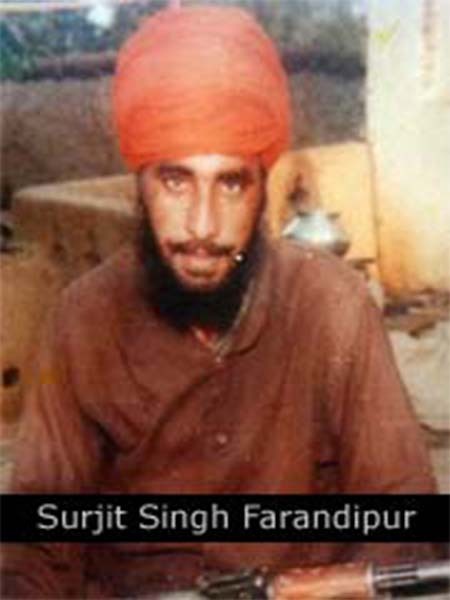 Bhai Sahib is from the family who have given the present Sikh armed struggle many warriors such as Shaheed Bhai Heera Singh Babbar (Padhri) of Babbar Khalsa International, he was the Mama Ji of Bhai Sahib and Shaheed Bhai Mahinder Singh Fauji Lt. General Khalistan Commando Force who was also the Mama Ji of Bhai Sahib. After the shaheedi of Bhai Heera Singh Babbar, Bhai Sahib left home and completely dedicated his life to the Sikh Freedom Movement. Short while after the locals started to talk about the brave actions of Bhai Sahib. Bhai Sahib would always be doing sewa with his Jathebandi, recognising the immense sewa of Bhai Sahib, Bhai Sukhwinder Singh Sangha gave him the rank of Lt General of Bhindranwala Tigers Force of Khalistan. Bhai Sahib would always stay on basic clothes and would himself to as the servant of the Sikh Kaum. Under Bhai Sahib’s control the locals lived the life of peace, theft and robberies were never thought of left alone committing such acts. Bhai Sahib had given all women the respect of a mother or a sister, due to which the locals had great amount of love for him. The locals had much respect for Bhai Sahib as he resolved many domestic disputes. Bhai Sahib would always help the needy and the poor, he arranged the marriage of many girls from the poor households by finding them husbands himself. No Hindu was harassed under Bhai Sahibs control. Bhai Sahib would listen to everyone and give them advice according to the values of Sikhi. Whoever Bhai Sahib went to, they thought that they had a deep relation with Bhai Sahib, this was the biggest compliment of Bhai Sahib. Whenever a singh from his group attained shaheedi, Bhai Sahib would be very sad and hold Sri Akhand Paath Sahib Bhog at various programs. Once someone told Bhai Sahib to buy his family a tractor as they need it to move around, upon hearing this Bhai Sahib laughed and said, “My family can sell my share of the land and buy whatever they want.” Bhai Sahib believed it was a great sin to use the money of the movement to help his family and would say that if anyone used this money for the personal gains then they would be crippled. If someone did do such things, then they would be dealt with accordingly by Bhai Sahib. Bhai Sahib regularly share the actions of Bhai Avtar Singh Brahma and Bhai Jugraj Singh Toofan amongst his fellow singhs, he would encourage singhs to follow the footsteps of these Jhujaru Jathedars. Eventually that time also came that Bhai Sahib had been waiting for, the day of his shaheedi. On night of 25th October 1990, Bhai Sahib and Bhai Sarwan Singh Sema travelled towards the border to take care of some sewa when an informant had the two singhs surrounded by the Indian security forces. After a 12 hour fierce encounter both singhs attained shaheedi. Soon as the news of Bhai Sahib’s shaheedi reached the locals they gathered at the Bhikhiwind police station demanding the bodies of the singhs, but the cowardly police had cremated the singhs straight away their shaheedi. The family then held a Sri Akhand Paath Sahib in the village and thousands of people attended to pay their respects to Jhujaru who was brave as well as fair. Even today locals of Farandipur miss Bhai Sahib as he had bought stability in this area.